The Learning Lab exhibit at Museum of Future Government Services envisions an immersive educational environment offering dynamic course topics on demand. Stepping out of the bright street through a dark threshold you are surrounded by an alien landscape. Sharp winds and radio transmissions crackle in the background as you stare through the panoramic eyes of a robotic rover. Signs of life scatter the harsh Martian landscape before you. Picking up the interaction device you are greeted by an assistant named DATA who offers to help guide you through a curriculum exploring aspects of the recently established settlement. How did the Astronauts get here? What is a day on Mars Base like? As you follow your curiosity deeper into the questions, real time data continually streams in, peppering the landscape throughout the 360-degree view. Your lesson completes. Upon stepping back onto the street, you are invited to attend next week's course: The Great Barrier Reef. Specular collaborated with exhibition creative and production director Tellart on research, technology, and design of the Learning Lab. We chose a specific cliff side in the Candor Chasma region of Mars' Valles Marineris rift valley based on ideal locations for human settlement on Mars. The Martian landscape visualization was generated with elevation and color data from HiRise - a telescopic camera attached to NASA's Mars Reconnaissance Orbiter, a satellite currently in orbit around Mars. 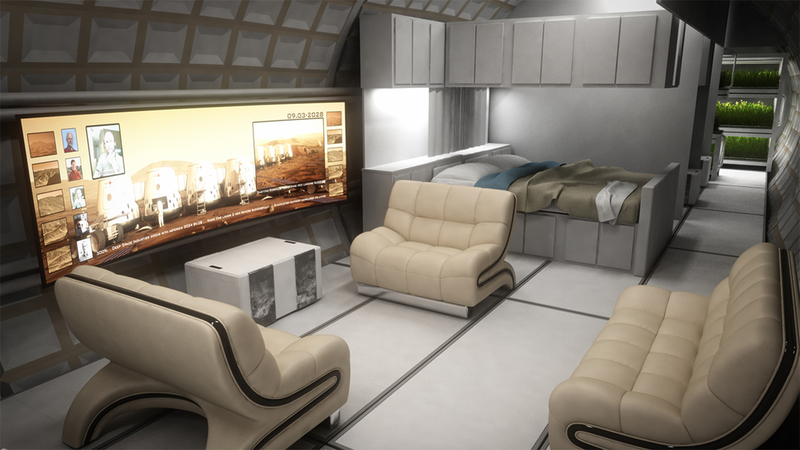 The design team engaged Bryan Versteeg, a specialist in 3D renderings of future space habitats for humanity. Together we visualized a plausible colony based on current research and near future technology. Versteeg designed the essential elements of a life sustaining habitat including a greenhouse, living quarters, energy generating facilities, and transportation rovers. A database of Mars facts drove the web of question and answer pairs, allowing visitors to explore a natural and personal course of inquiry. Each entry point to the system was presented in landscape in the form of small animations or objects. The 2015 Museum of Future Government Services is a project by the Prime Minister's Office of the UAE directed by Tellart with an international team of top design studios including Scatter, SOFTlab, Bompas & Parr, Octo, Idee und Klang, and Future Cities Catapult. The onsite build and installation was done by Tellart in collaboration with Publicis Live, Neumann Miller and Projex. Dome projection environment provided by Igloo Vision.